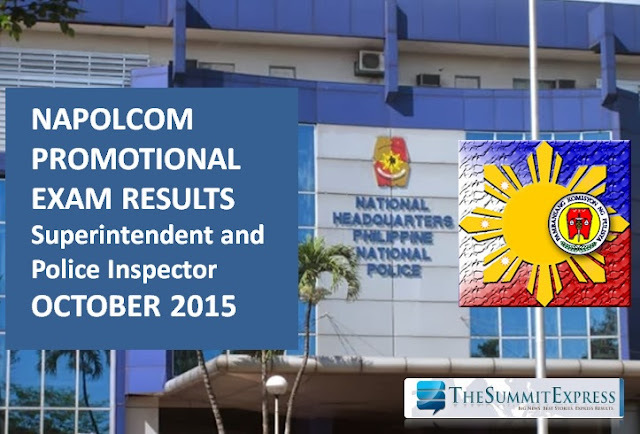 MANILA, Philippines - A total of 94 new Superintendents and 56 Police Inspectors passed the October 2015 National Police Commission (NAPOLCOM) promotional exam held on October 25, 2015 in different locations nationwide. NAPOLCOM officially released the complete results on Friday, February 12, 2016. Darwin Malonzo Serna topped the Superintendent promotional exams with 81.20% grade while Godofrey Estipular Mercado got the highest grade for Police Inspector exam after garnering 79.94%. On January 8, NAPOLCOM has released results for Police Officer and PNP Entrance exams. The three-hour entrance examination for promotional examinations covers general information, police administration and operations, and police customs and tradition/values and ethical standards. Aside from online availability of results, the list of successful examinees will be posted also at the 7th floor, NAPOLCOM central office located at the DILG-NAPOLCOM Center, NAPOLCOM Bldg., Edsa Corner Quezon Avenue, West Triangle, Quezon City and at all 17 NAPOLCOM Regional Offices. The National Police Commission conducts two sets of police exam every year. This includes Promotional Exam ( for those who already in the police service) and another is PNP Entrance Exam (for those aspiring to enter PNP).